The Vietnam war gave way to much more than domestic turmoil alone. Within the military the 'conducting the war from Washington', the unrealistic attributes attached to enemy assessments, are suggested to have left an indelible indention in the minds of many units commanders. This 'shaping of minds' had a protracted influence on future conflicts and is suggested as the cornerstone for the military thinking of today. The most noticeable occurrence of this was Desert Storm. Beyond the brilliance of leadership, and balanced hierarchy decision making, were the mutual consenting efforts of the Washington D.C. and the commander in country. The concept clearly resulted in victory. Past the most known issues, the Vietnam war also had attached several concepts and items of equipment not fitting the military mold of the day. 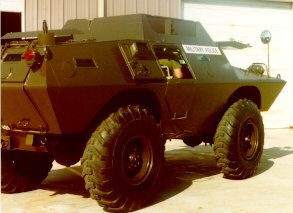 Of these was the V-100 Armored car. A wheeled vehicle to be deployed in the manner addressed in Vietnam had not been seen since Word War II, and Korea, where the famous Greyhound was used. Many commanders suggested there was no need or 'usefulness' of a wheeled tactical vehicle. In their belief, the assets could be better spent on other armament development. In a broad sense they were correct in saying a general application did not exist. 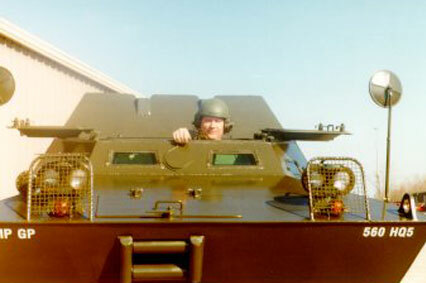 For specialized units however, the V-100 proved a very fitting vehicle indeed. 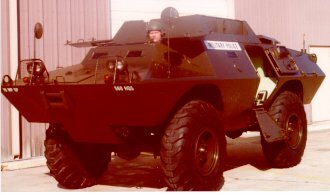 Primarily US Army Military Police, and US Air Force Air Police units used the V-100. 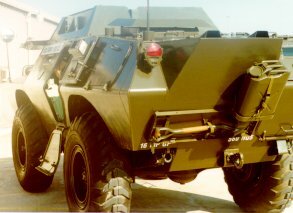 Competent in terrain which restricted the maneuverability of full tracked vehicles, the V-100 proved reliable and effective as a combat vehicle in the selected roles. The V-100 was produced in two basic models. 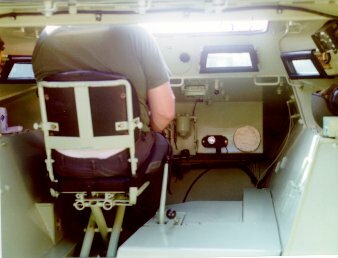 In the first a turret was affixed and manually operated. The basic design of this model was two .30 caliber 1919's or a combination of a .30 caliber and a .50 caliber machinegun, or a cannon. 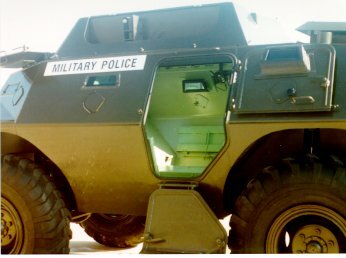 Primarily, MP units of the US Army used this version. The model primarily used by the Air Force had an open parapit with machinegun hard points. This model gave a degree of protection while allowing the massing of fire on selected areas. The parapit opened through two large bi-fold doors affording a greater access to fire points that the turreted version. Only a handful of these historic vehicles exist. The samples available at the National United States Armed Forces Museum were both obtained as bare hulls. Each was totally rebuilt and finished in an exacting military configuration representing each of the major models produced. Vehicle Weight of 14,000 Lbs.